Today we're continuing our All in the Family series, featuring sisters Jean Ann Wright and Janet Houts. 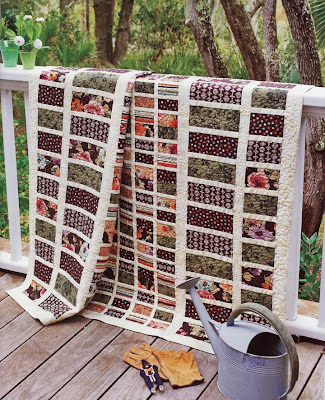 Can you talk about how/when you learned to quilt? Jean Ann: I learned to sew when I was 3 years old; it was a disaster. I can still see myself sitting in a little chair with that doll skirt attached with crooked stitches to my own skirt. I was so proud. I cried when I had to tear it out. I didn't give up, I kept sewing and sometime during my growing up years I started making quilts, first for dolls, and then in my early 20's my first real quilt for my first baby. Tell us about quilting with your sister. 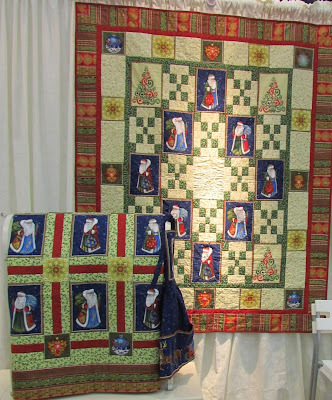 Jean Ann: I started quilting with my sister, Janet Houts, about 10 years ago. 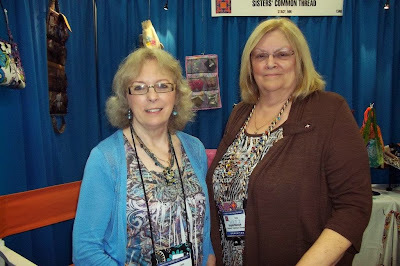 We are still quilting together and have written several books together and often collaborate on quilts we are designing and making. How do your designing methods compare? 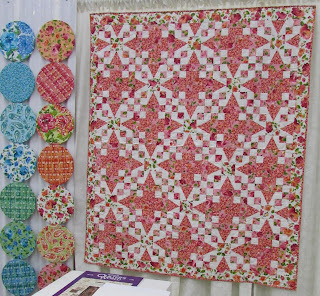 Jean Ann: I like quilting chaos. I like to start sewing and let the fabric "speak to me" and tell me what to do as I go. Janet likes everything organized and planned out in advance so she knows exactly what she will be doing step-by-step before she starts cutting and sewing. How would you describe your quilting styles? Jean Ann: My style is colorful, uninhibited and freestyle. Janet's style is planned, coordinated and well ordered. Can you describe how you work together? Jean Ann: I live in Georgia and Janet lives in Idaho. We typically work via Skype. We can turn on the video and actually see what the other is sewing. We also work via the computer, sending art files back and forth with suggestions to change this or that until we both like what the other is doing. We don't always take each other's suggestions, but most often we do. Two heads are better than one! 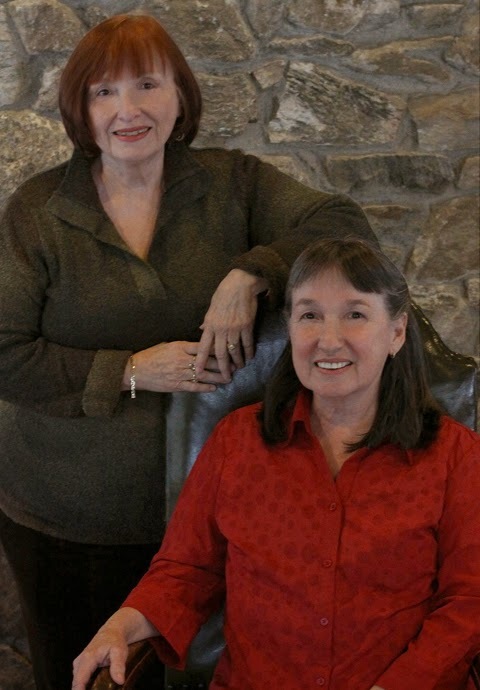 Once a year Janet and I teach a 3-1/2 day workshop together at the Kanuga Conference Center in Hendersonville, NC. When we are not in the workshop room, we are putting our heads together in our own room to think up new ideas and techniques for teaching. What's the greatest benefit of working together? Jean Ann: We always have someone to check our work, to make suggestions on how to improve our designs. Also, being together is more fun than always working alone. After growing up together and then living on opposite sides of the country for most of our adult lives, it is great to have a creative reason to be in touch with each other every day. And a challenge of working together? Jean Ann: When one of us feels strongly that the other should change a design and that one digs in their heels and insists on leaving the design as it is. How have your roles changed over the years? 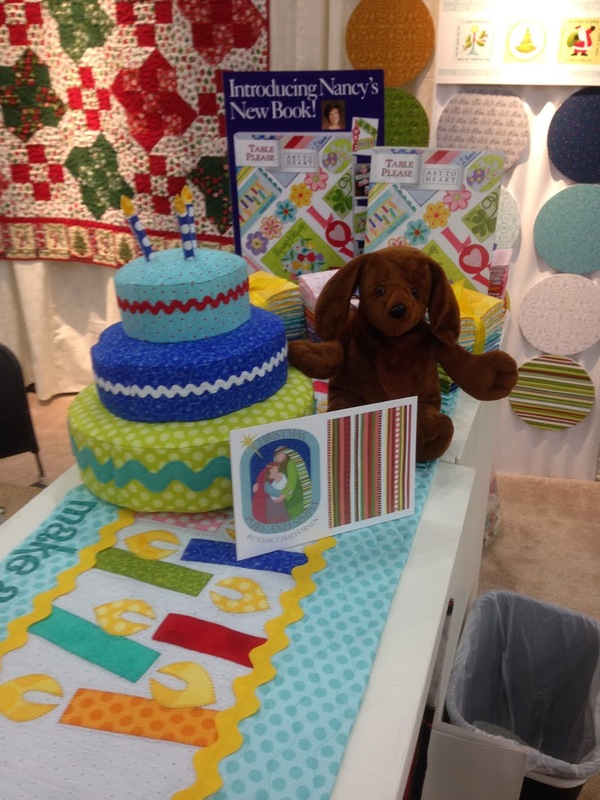 Jean Ann: Janet started out working for me when I was editor-in-chief of QUILT magazine. After teaching her to quilt so she could help me with the graphic arts for the magazine, I find myself learning from Janet as her computer skills were more advanced than mine. We have reversed roles and it comes very naturally to us. I may be older, but I am not always in charge! Can we see some of your designs? There were three fabrics in this collection that could be used as "focus" fabrics due to their distinctive design and the scale of the fabric design. I finally decided on a strippy quilt with my favorite focus fabric, the dark print with the birds cut as columns on the length of fabric. 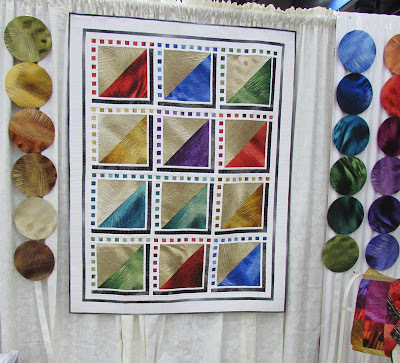 The Bachelor's Puzzle blocks provided strength in the center of the quilt. I pieced Flying Geese units on opposite sides and emphasized them with the wide multi-stripe and narrow brown strips to complete the quilt center. I decided to use the patchwork print as the top and bottom borders of the quilt and chose the narrow brown strips to divide the border elements and used the light bird and vine print for the side borders. 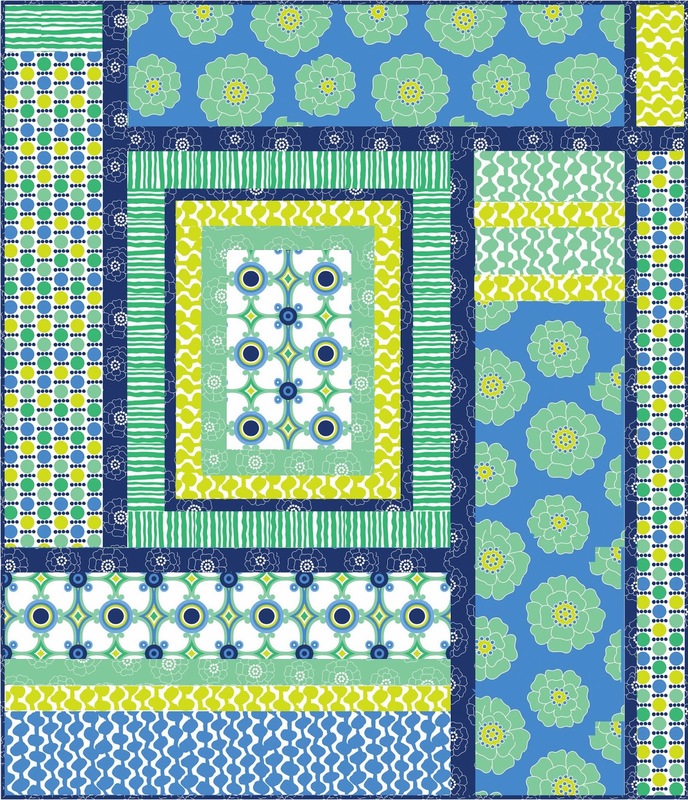 A contemporary collection was the perfect fit for a hexy design, considering how hot hexies are right now! 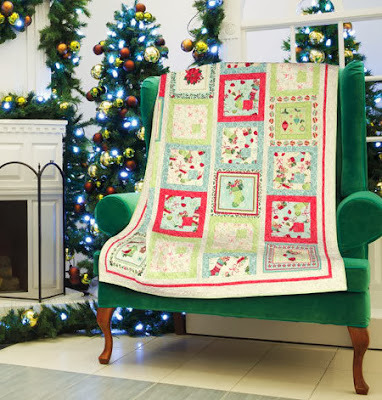 This quilt is featured in the Winter 2014 issue of Quilt Trends magazine. 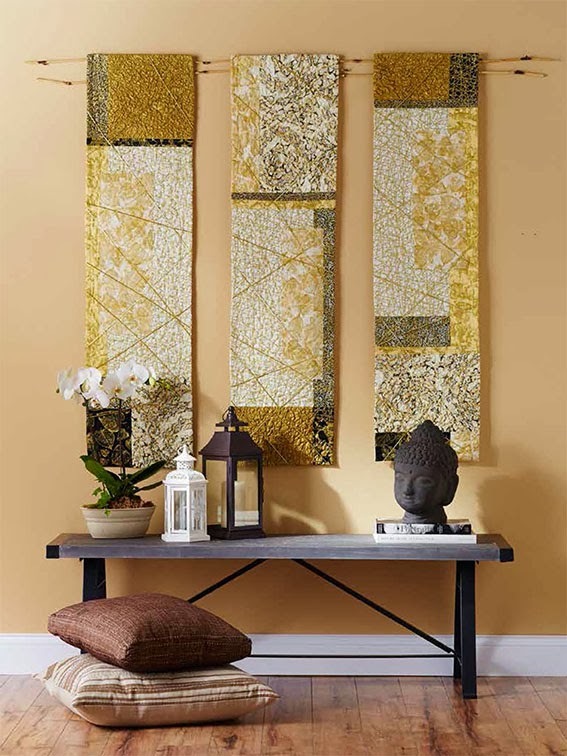 Find more of Jean Ann and Janet Hout's work here. We're back with another All in the family post, this time featuring Melanie Greseth and Joanie Holton of Tailormade by Design. 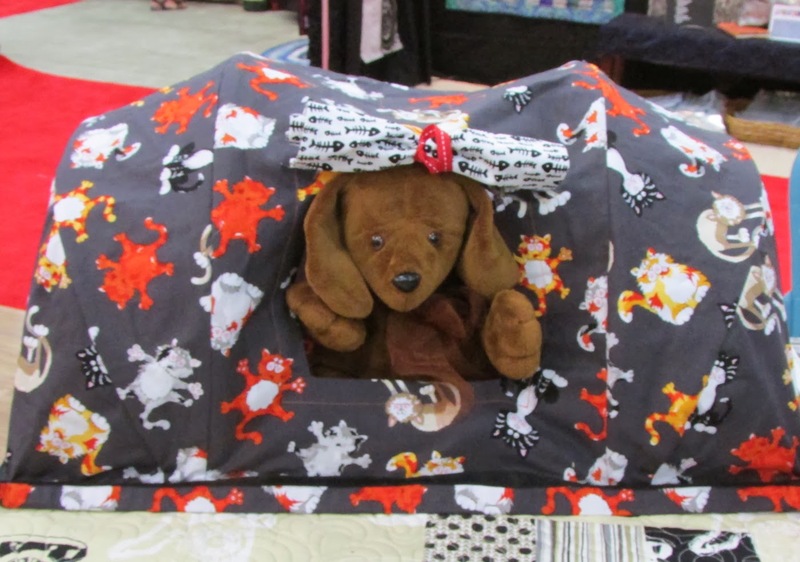 What drew you to sewing and quilting? 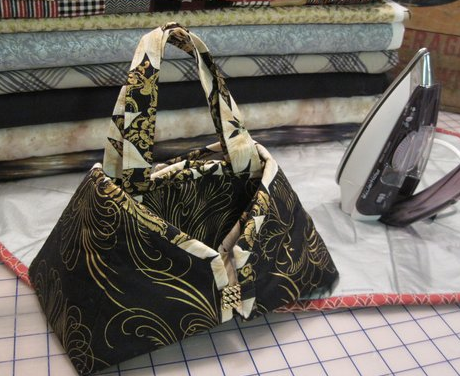 Joanie: Our mom sewed forever so she was always sewing around us. She taught us how to sew. Each of us kind of came into it at our own time. Melanie has always sewn. I didn't start sewing for myself until further into college. 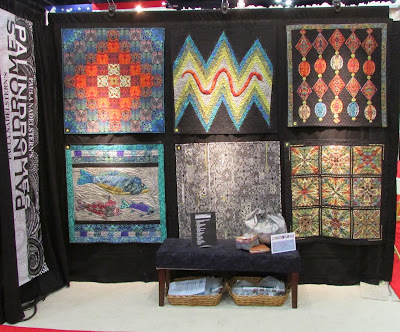 We started quilting once we got into the industry; we started out creating booth décor [for companies for Quilt Market] and then really fell into the quilting end of it. How did you come up with the name, Tailormade by Design? We were tossing around terms from the industry. 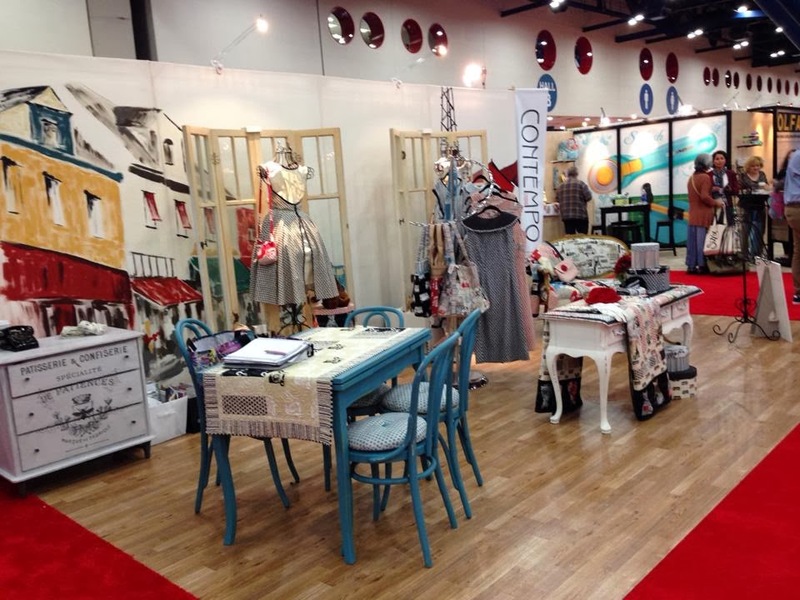 When we started, and it was a lot about booth design, the idea of tailoring what we did to what people needed. So we came up with Tailormade by Design. How do you typically work together? Joanie: When we started, we lived a little more than an hour apart. It was very easy to run over to Melanie's house (she had a studio space), and work together. We work best when we can bounce ideas off each other. A few years ago, Melanie moved a couple states away. It's been an adjustment, but the Internet helps—we just send more emails and make more phone calls. We're definitely on speed dial for each other! We do meet 3-4 times per year and take advantage of that time to get a lot done in person. We both design and sew, but I probably end up sewing more than Melanie does. She is very good at organizing and project managing, so she takes on more of that side of the business. Also, with her graphic design background, she has the final say on color/balance, how everything plays together. I'll usually write the patterns, and then Melanie will do the graphics, layout, and edit what I wrote. It's really great to have another set of eyes. Joanie: We both like all styles. But I think we each lean one way: I'm a bit more traditional, and Melanie is more contemporary. What's a benefit of working together? Joanie: We are really very supportive of each other. There aren't many workplaces where you get the kind of support family gives you. We have a really good understanding of each others' strengths and challenges. The best part? Working with my best friend. How about a challenge of working together? Joanie: The distance has been a challenge we've needed to adjust to. Also, when we're together, sometimes it's hard to turn it off and just be with our family. What's one surprising thing about working together? Joanie: When we were younger, we always had coordinated outfits for every holiday, and Melanie was very annoyed she had to look like her little sister. Now many years later we're together all the time and everyone assumes we're related because we look so much alike. Our mom always teases us and says 'I never would have picked you two to work together.' Now we're together all the time and end up looking the same a lot. 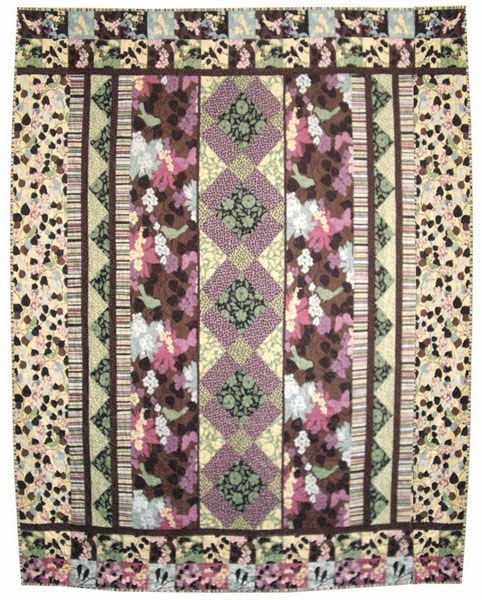 We used Melanie’s fireplace hearth as our inspiration for this quilt, made using Interlude by Michele D'Amore. The brick work pattern is just like this, and it made just a beautiful quilt. Find more about this quilt and two additional Interlude projects designed by this duo here. 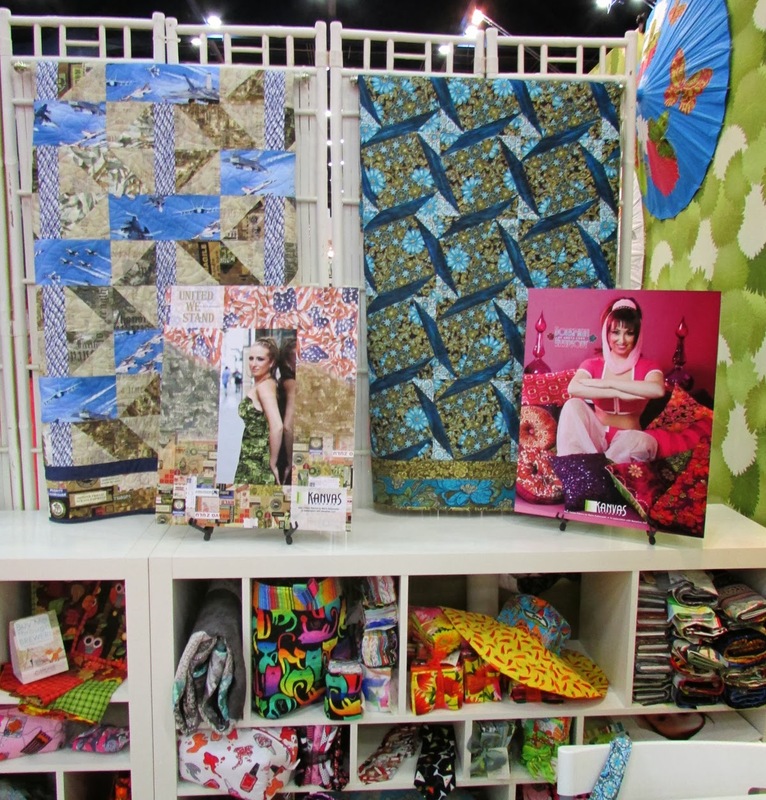 Three quilts we designed using Manhattan Modern for Benartex's Quilt Market booth. 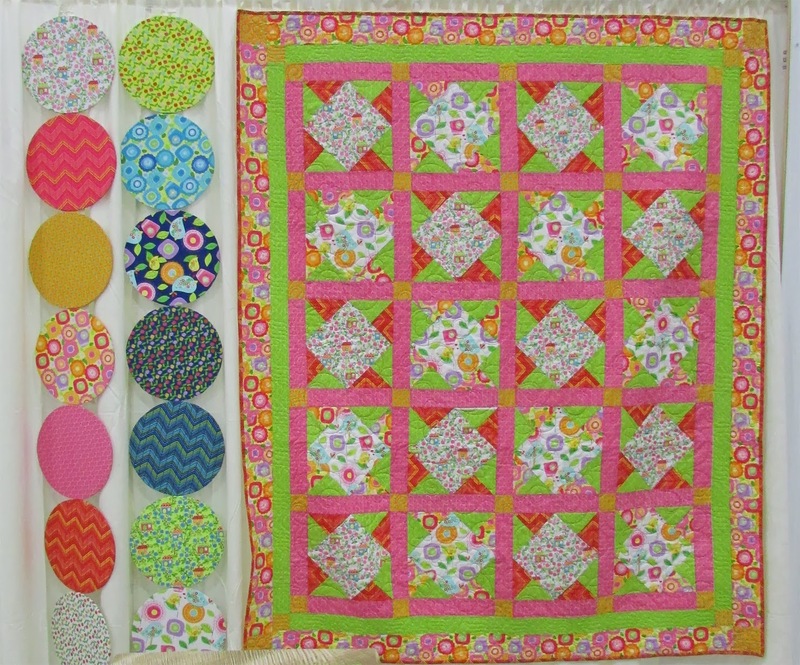 So fun to see how different the fabrics look with both modern and traditional blocks. Modern Baggage: We wanted to make a fun, take everywhere tote for Op Art Reflections from Kanvas, a fun geometric line. Find out more about Melanie and Joanie and their work here. With the holidays approaching many people are preparing to spend time with family, whether for a meal or a few days. It's often the best part of the holidays (though you can argue that the food is a close second!). We started thinking about families we know who sew together and wanted to focus on some talented dynamic duos who create patterns using our fabric—related by blood and sewing together by choice. We'll be sharing their stories over the next week. 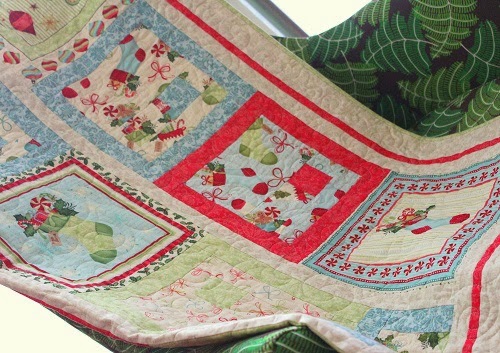 Tell us about how/when you learned to quilt. Angie: I never was a seamstress other than making an apron in Home Ec Class. Mom sewed almost all of our clothes when we were young. I didn’t have to sew. When we were older I’d drive by Yvonne’s home on the way to work and drop off a pattern and some fabric – and on the way home I’d stop back for a fitting. So there was no need for me to learn! A friend who ran the church quilt group asked if I would join them for a ''mystery project'' and mentioned we'd go out to eat afterwards. 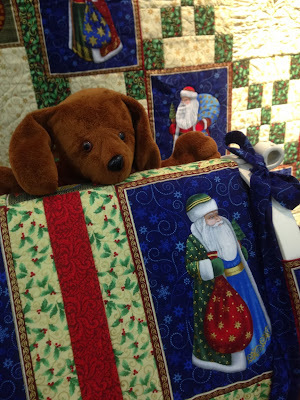 She grabbed my attention with the going out to eat part, and I got hooked on the quilting too. Yvonne: Heck, I was probably 5 when mom let me sit in her lap and sew up a doll dress with no pattern. Sewing and designing just came naturally to me. 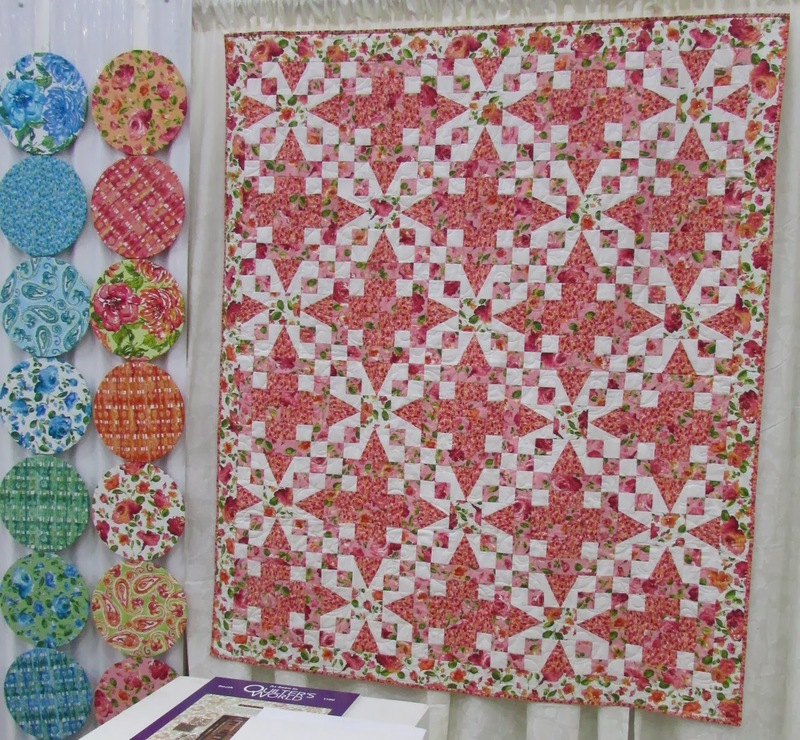 Back in the 70’s, when my kids were little, my term for quilting was “recycling.” Quilting was not an art then and it certainly wasn’t an industry like it is now. 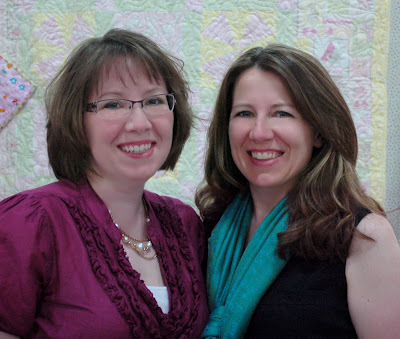 Why did you start quilting together? 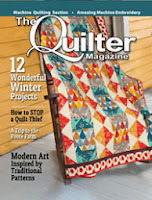 Angie: After my first project I made a king-size rail fence quilt as a gift but couldn’t quilt it. Soon after that Yvonne and I were shopping together and I remember we were sitting in the parking lot of a mall talking about what we had always wanted to do in life – I wanted to own a Laundromat and a mini-storage. Surprisingly she said a mini-storage was on her list too. 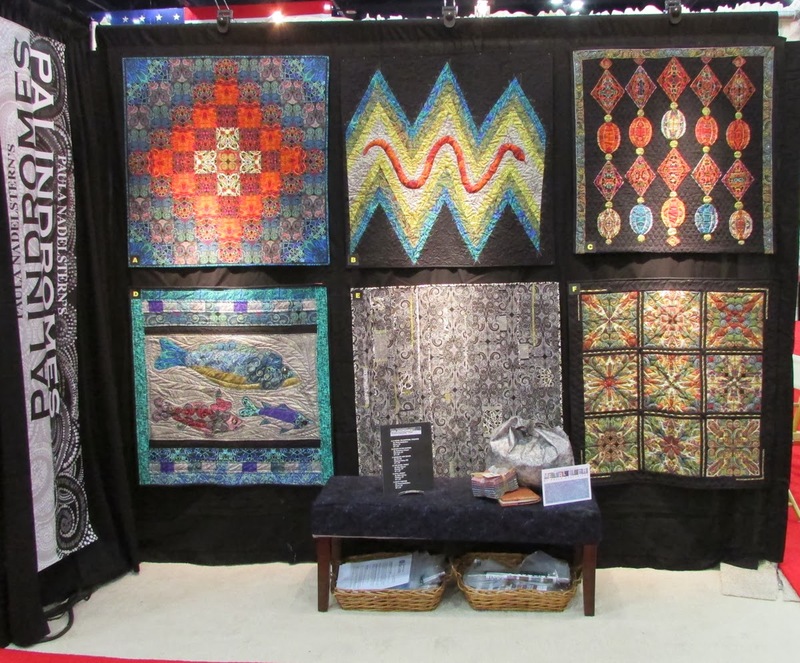 We talked about the quilts she was making and the one that I could not get under my machine to quilt and started talking about long-arm machines – well, to cut the story short, within a month we were driving to Iowa to pick up our new Millennium by APQS. We long-armed together for a few years. In 2004 we ran into a mitten that just simply was not put together well – the thumb just wasn’t good and we thought “we can do better than that” so we created the Toastie Mitten pattern. 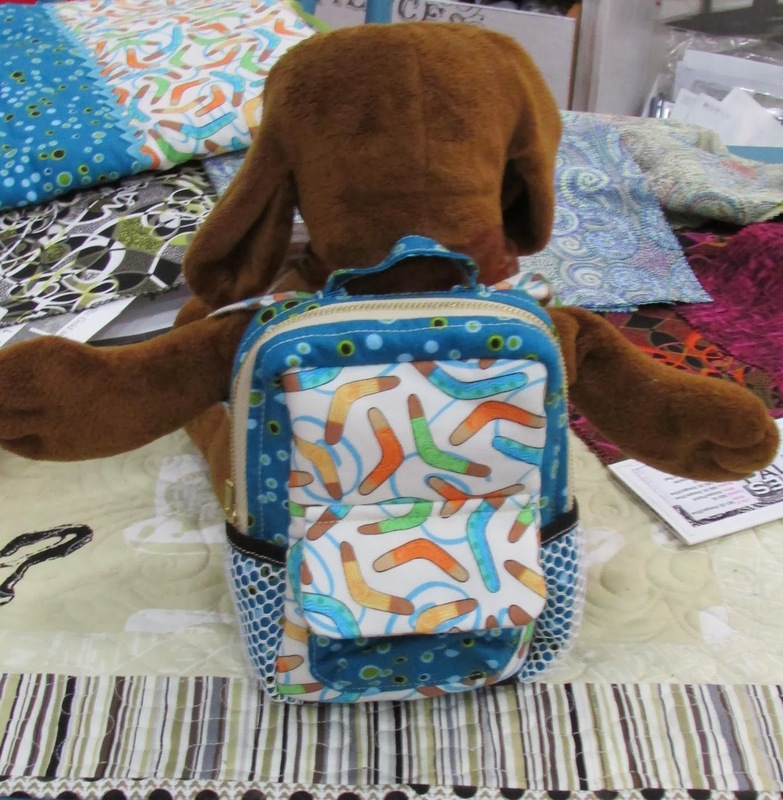 We sold that single pattern and taught classes until 2010, when Yvonne came up with the Caddy Pad idea. Eight patterns and two Quilt Markets later, our company started to take off. Angie: It didn’t take me very long to realize that I was not a pattern designer and designing was always in Yvonne’s blood. Yvonne is absolutely brilliant. Company duties just naturally divided themselves, we didn’t even need to talk about it. I started the number crunching end of the business and Yvonne had time to design. Yvonne: Angie’s a natural on the phones and interfacing with customers and distributors. She keeps track of the sales, website, invoicing, shipping etc. I, on the other hand, stammer when the phone rings and say really inappropriate things that Angie has to apologize for later so I only pick up a phone in an emergency. We have a lovely studio in Angie’s home, and Yvonne drives over once a week. We spend our time working/playing/planning and Yvonne spends the night and goes home the next afternoon – these are the two best – absolute best – days of the week for us both. We kick the patterns back and forth via email, me writing and Angie formatting and making pretty. Decisions just seem to fall into place; we did enough fighting as kids that it’s pretty much out of our systems by now. Any good stories about getting your business started? Angie: Funny thing happened to us on the way to market: Kansas City, 2012, first market, HUGE deal. We had this adorable little 8’ trailer, with a picture of Mona Lisa on the side, holding a Caddy Pad. 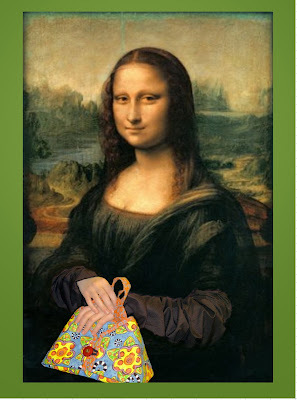 Mona Lisa needs a Caddy Pad! 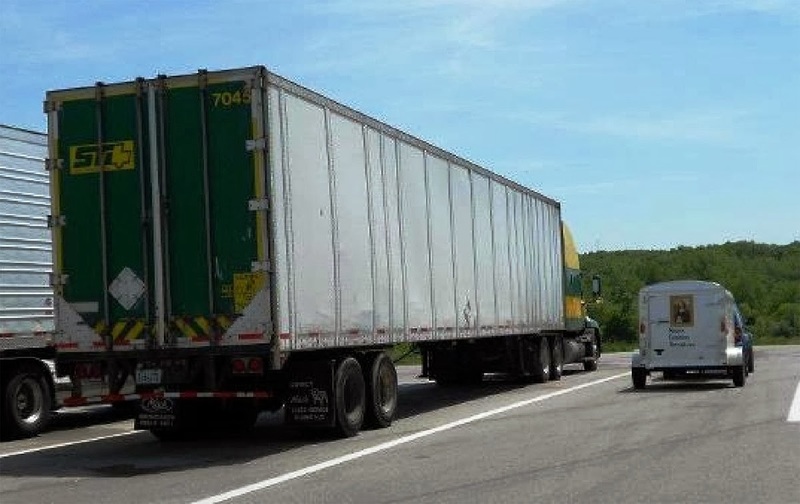 Our trailer was pulled by a little blue Jeep Liberty, filled to the brim with precious market booth cargo – fixtures, inventory, brochures, models, booth drapes, everything. Oh my goodness were we ever excited and so very, very important!! We were just flying on cloud 9!! We stopped at a rest stop along I35 – typical pit stop – and as we came out of the building and proceeded across the parking lot to the parking area this was what we saw. That’s us on the right if you didn’t guess. Wow, what a reality check. We were so humbled. After standing in the middle of the lot laughing hysterically at the sight of us we realized we’re just a small fish in a very big pond, and ever so glad to be part of the greatest industry in the world with the greatest people. How did you get involved with Benartex? Angie: We were walking around Quilt Market in Portland and were absolutely DRAWN to the Benartex booth. We sat down and ordered the entire Moon Shadows line by Michele D'Amore. We absolutely LOVED it, could not take our eyes off it. 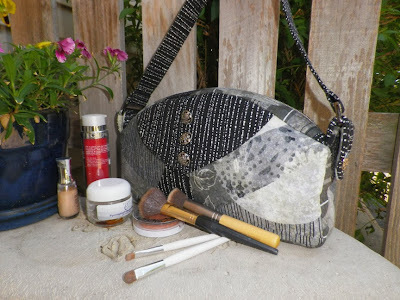 Our intent is to make an entire line of bags using Moonshadows. Can we see some of your patterns made with Moon Shadows? The 990: We saw a designer bag that we absolutely loved, but it was selling for $990 (outrageous!) and the fabric really wasn't very attractive. Yvonne took inspiration from that and created The 990 pattern. 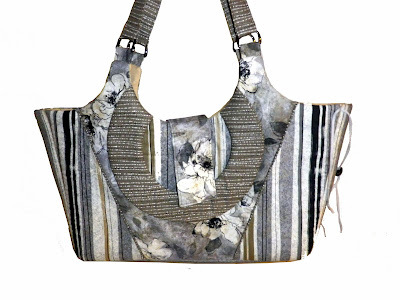 The Quick Change (garment bag) and New York Style (huge tote that the Quick Change can slip into) are two upcoming patterns--watch for their release soon! The New York Style and Quick Change Garment bag are items that can get you through a little weekend trip in great style, just big enough to hold a couple changes of clothes and other necessities. The name says it all for this purse or makeup bag; it'll hold what you need! Running a business probably isn’t supposed to be this much fun – we are INCREDIBLY BLESSED – and having the time of our lives. p.s. We did, by the way, buy that mini-storage together, but that’s another story for another day!!! 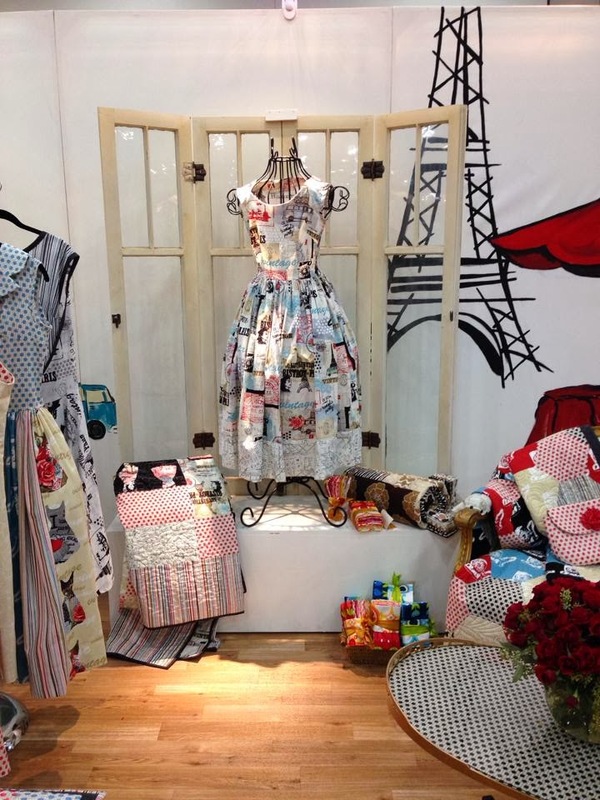 Find more about Angie and Yvonne and their patterns here. See the entire Moon Shadows collection here. If you're anything like us, you had grand plans to finish a quilt for the holidays early this year, and it didn't happen. And with Thanksgiving around the corner and December fast approaching, you're probably feeling like it's not going to happen. We can help you change that feeling! Meet the "Boxing Day" quilt. Wendy Sheppard of Ivory Spring designed "Boxing Day" for The Quilter magazine. 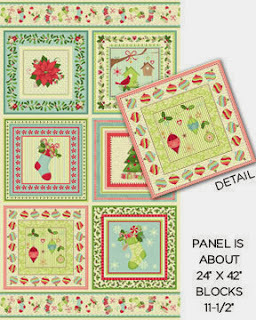 This quilt combines super-easy pieced blocks with pre-printed panel squares from Michele D'Amore's Home for the Holidays collection. Wendy will take us on a little tour of her quilt and design process. What attracted you to the Home for the Holidays collection? The colors - I love the traditional Christmas colors. To see the palette of the collection come in softer tones was exciting, and I love how the blue was mixed in for a slightly contemporary look. Why did you decide to mix pieced blocks and the fussy-cut squares together in the design? 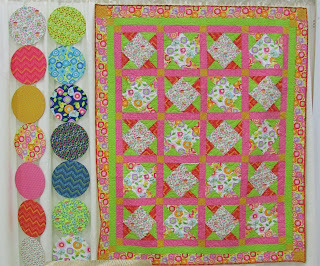 The panel has 6 different block scenes, and since I wanted a larger quilt, I needed something else to fill in the gap, so to speak. What prompted you to add the solid colored square in the pieced blocks? After deciding on what pieced blocks to use, I wanted the blocks to reflect the spirit of Boxing Day. The solid colored squares represent the goodies contained in the "gift boxes." Can you talk about your layout decisions? I was trying to use the vertical strip layout to show a slightly different way to incorporate panel and pieced blocks in a quilt. 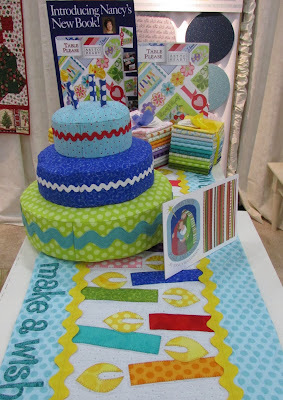 I wanted the focus to be the quilt center. Therefore, I didn't use a print for the outer border. 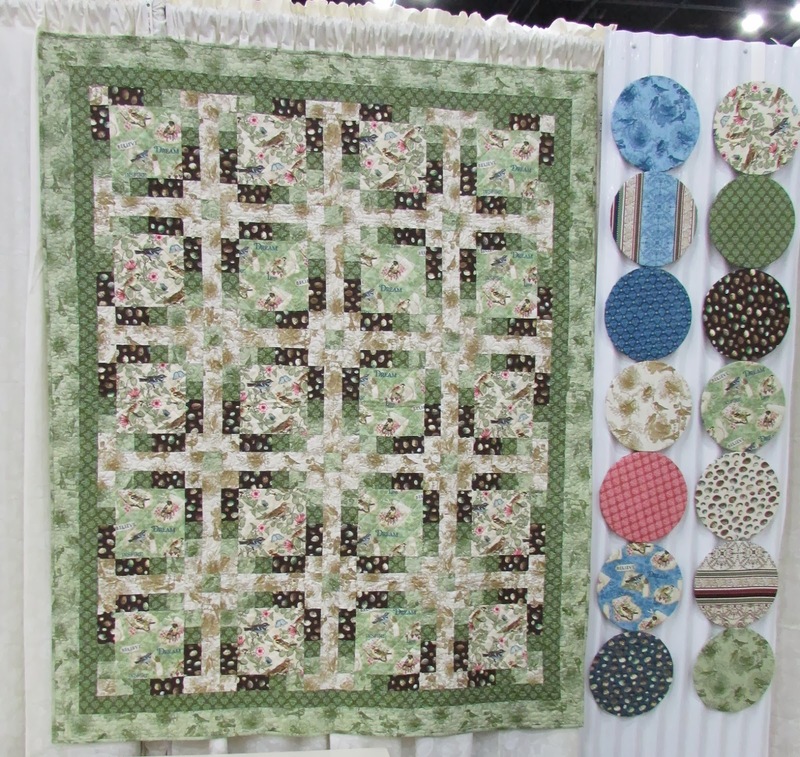 And I intentionally did a relatively narrow outer border to emphasize focusing on the quilt center. 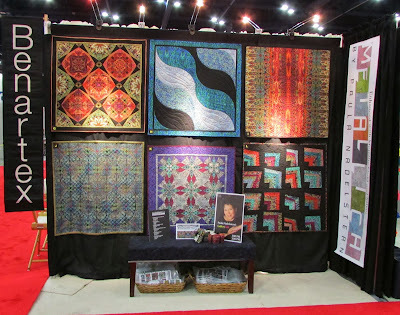 I chose the red narrow sashing to frame the quilt center so that the eye would be drawn to all the interesting details in the quilt center. 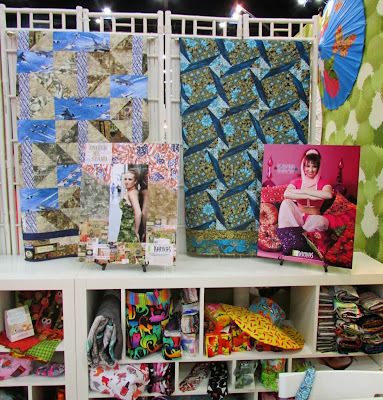 The fabrics - the prints are just perfect for a fresh, and yet traditional quilt. Talk about the machine quilting motif you chose. I quilted my Jester's Hat motif in large scale for texture. I didn't want the quilting to take away from the fabric prints. I have written about my Jester Hat motif about here, here and here). Thanks Wendy! 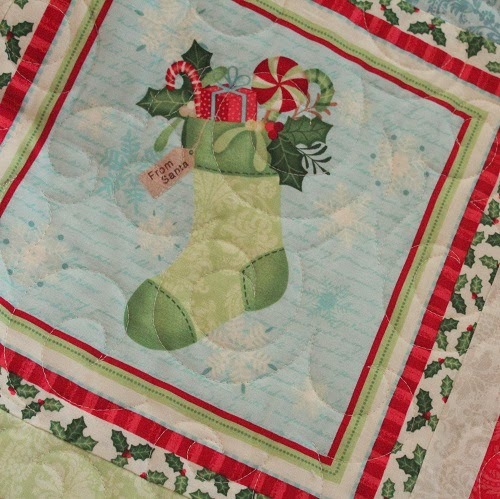 What a great holiday quilt! See the entire Home for the Holidays collection here. Read more about Wendy here and see her post about "Boxing Day" here. Benartex booth: A little bit of something for everyone! 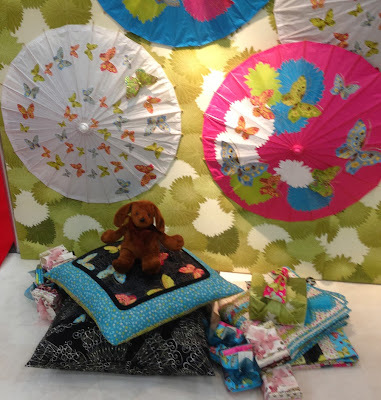 The main Benartex booth showcases a wide variety of new collections by our talented designers. 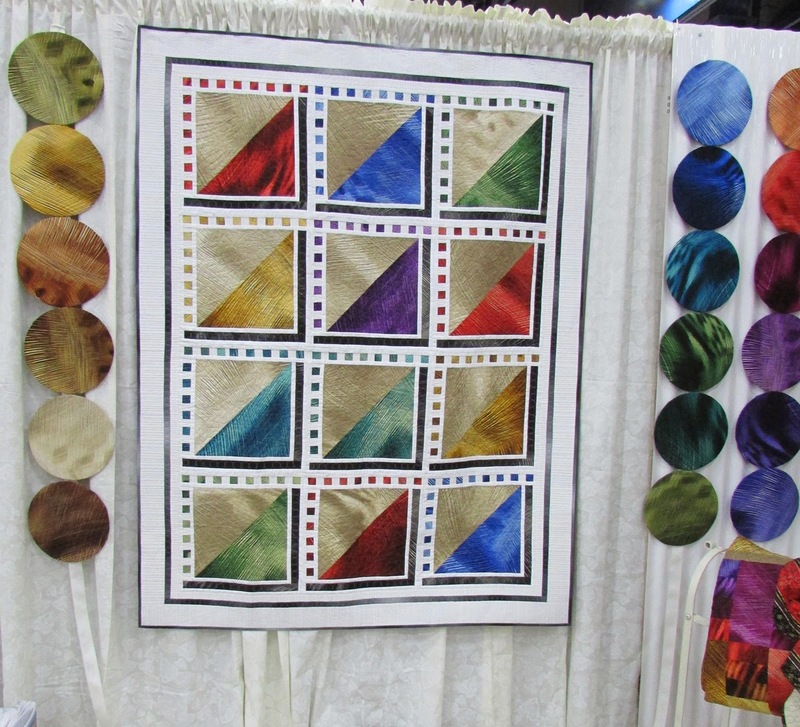 Paula Nadelstern's Palindrome, showcased in a gallery of twelve art quilts made by Paula's contemporaries. From Nancy Halvorsen's This N' That collection and new book from Art to Heart, "Table Please." The "Sweet Carolina"quilt by Tailormade by Design features the Sweet Tweet collection. You'll soon find this pattern free on our website. It's called "Flying My Way" and was made by Tailormade by Design using the Birds of a Feather collection. 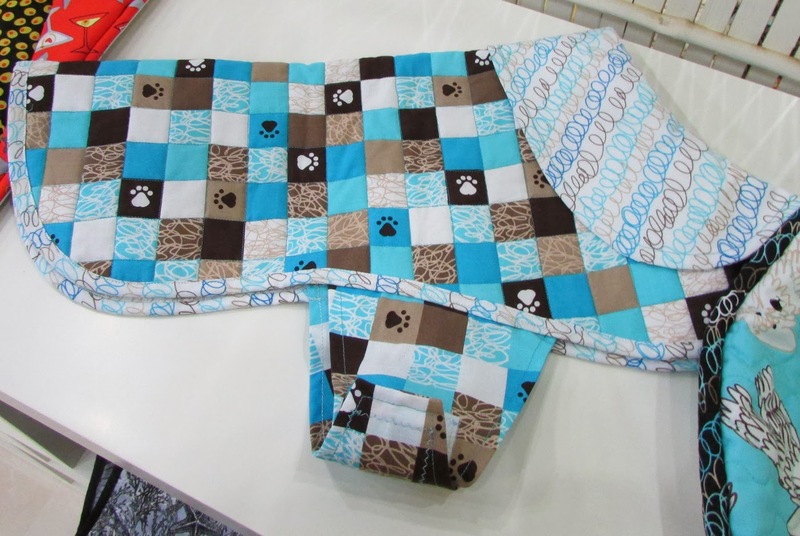 It's fun to show off smaller sewing projects too, like this quilted dog jacket made from Doodle Dog by Maria Kalinowski for Kanvas Studio. 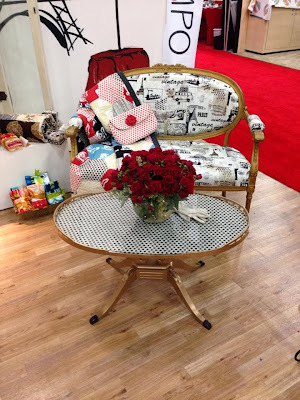 The "back side" of the Kanvas booth: haring new Kanvas ads (yes, that's a take-off on I Dream of Jeannie, promoting Bohemian Rhapsody by Maria Kalinowski for Kanvas Studio). 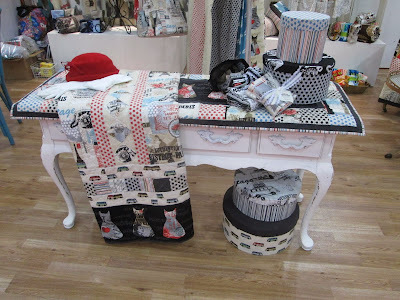 The shelves are stacked with inspiration that we share with shop owners...plenty of small sewing projects (like the dog jacket above) created from our fabrics. Wearing the cutest little backpack made by Sisters' Common Thread made from Greta Lynn's Down Under collection from Kanvas. 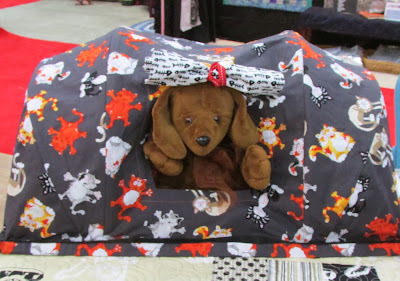 And finally the Alley Cat tent (made by Sisters' Common Thread) where he hunkered down each night to rest after a long day as Benartex's poster dog. Want to view more from Quilt Market? 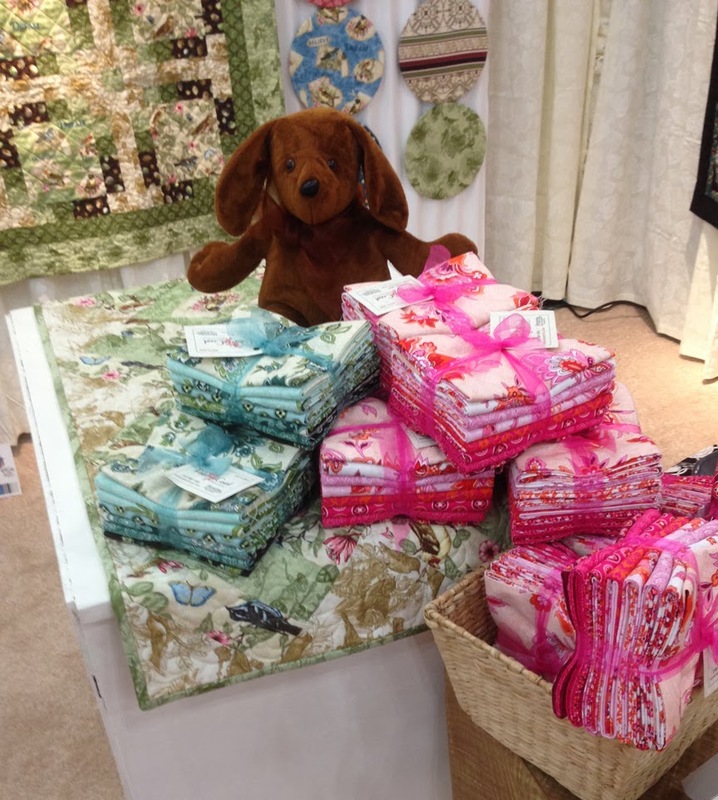 See our post on the award-winning Kanvas Quilt Market booth here. Check out our Contempo Studio booth here. 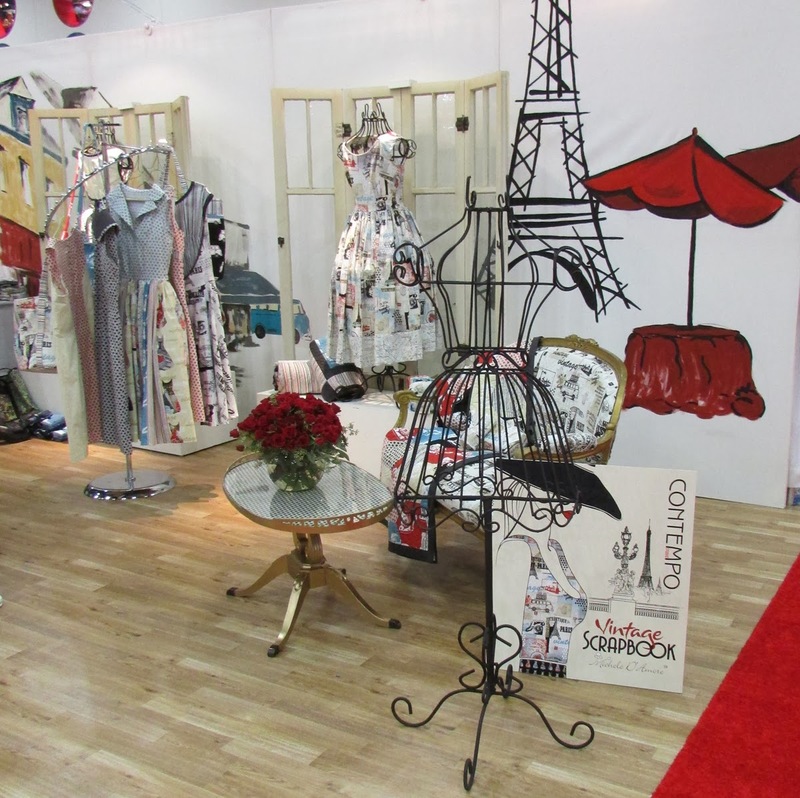 Our Contempo Studio booth has a Parisian dress shop feel, showcasing the soon-to-be-released Vintage Scrapbook collection by Michele D'Amore. Dress forms, window frames, cafe tables and the Eiffel tower in the background...it's so inviting that you're tempted to pull up a chair and order a croissant (chocolate, please!) and cafe au lait! Dresses with a vintage feel sporting classic polka dots and French motifs from the collection. The patterns came from some actual vintage patterns that Melanie Greseth and Joanie Holton of TailorMade by Design found in their mother's stash. 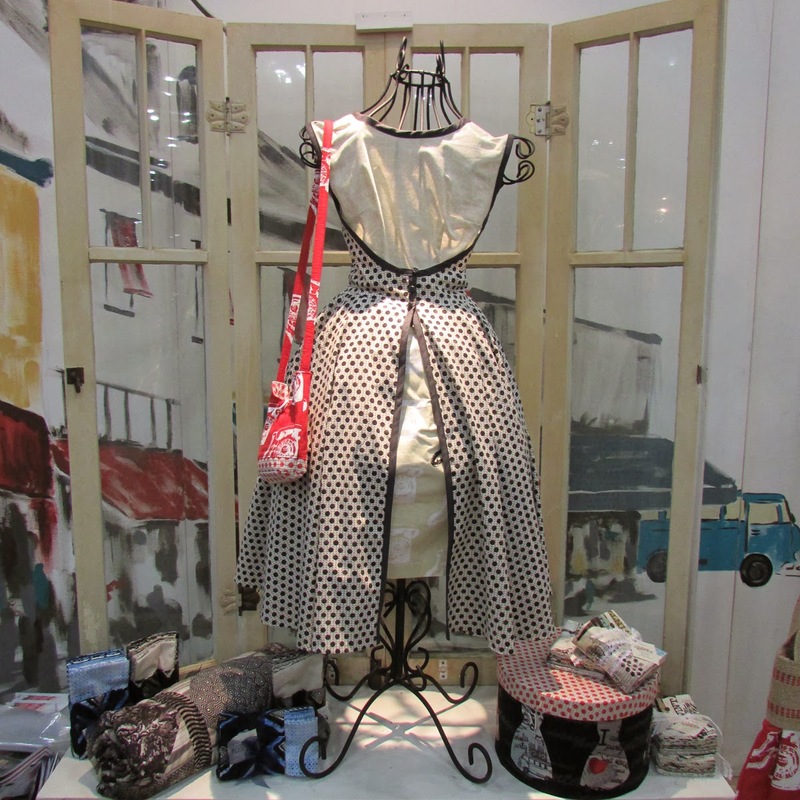 The patterns range from the 1940's -1950's and are from companies like McCall's, Butterick and Advanced. 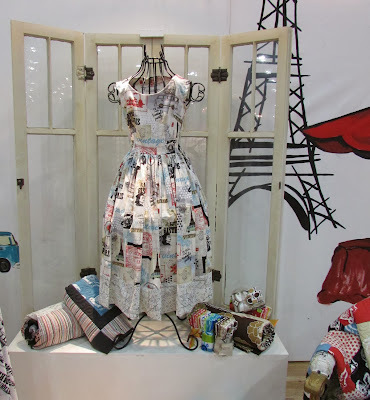 Just look at these beautiful dresses! 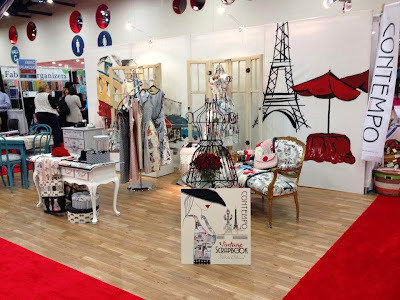 Stepping back: a look at the entire booth. Doesn't it make you want to book a trip to Paris? Even Benny loved the Contempo Studio booth! Do you see him here? The art on the back walls was handpainted by Melanie Greseth. The inspiration behind this backdrop came from the fabric. 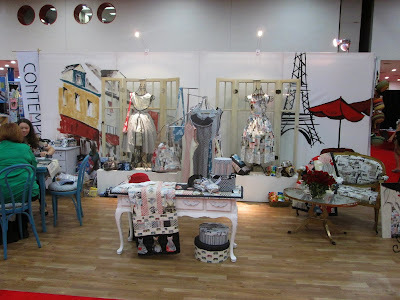 It lent itself so easily to a Parisian cityscape, that Melanie knew that the booth needed to have it. 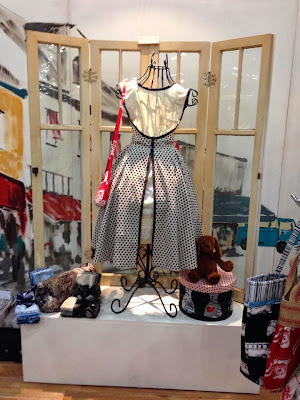 Who wants to try on the dress in the window? Come on in and take a seat with our chic polka dots galore and a chair upholstered in sewing shop toile. 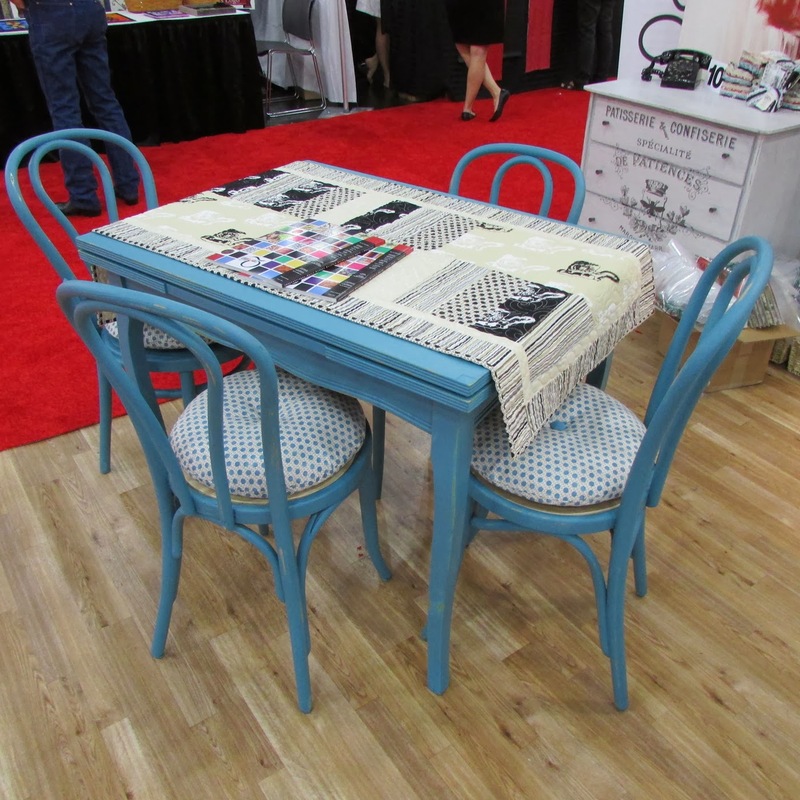 Table for four with a Vintage Scrapbook runner: Cafe au lait, s'il vous plait!